No fewer than 21 riders set times in the one-day test at Imola, which were held in dry conditions after the dry race weekend. 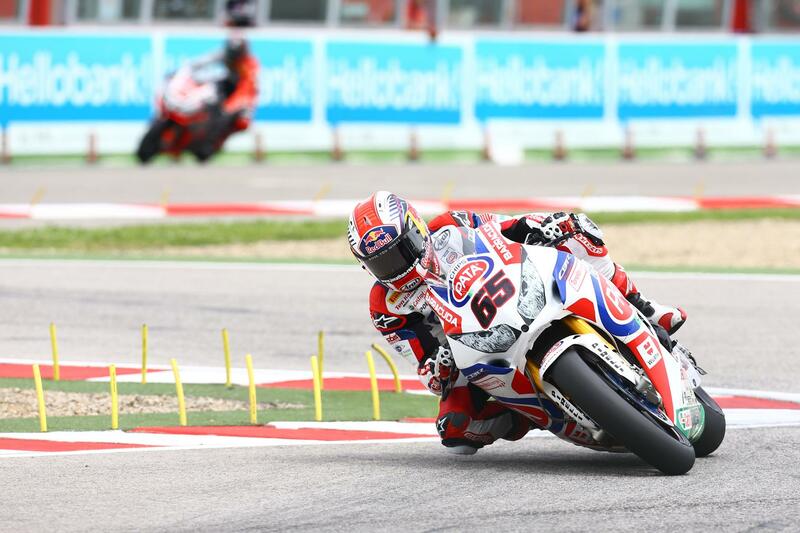 To no-one’s surprise Jonathan Rea (Pata Honda) was fastest, using some new electronics strategies to set a 1’47.225. Only just behind, Chaz Davies (Ducati World Superbike) put himself 0.085 seconds from a morale boosting top spot, as he strove to get rid of high frequency vibration from his Ducati Panigale machine. He partially succeeded and went for a fast time late in the two-part track session. The testing order mirrored the race result from the weekend in each of the top two positions, but things changed behind the leading British duo. A great day’s effort from Toni Elias put him third after what he said was his first proper test this season, when he could try out new things on the Red Devils Roma lease Aprilia. He did 99 laps, more than any other rider. Finding a positive in his machine’s ability to keep its balance entering corners allowed Eugene Laverty (Voltcom Crescent Suzuki) to jump up to fourth fastest right at the end. Davide Giugliano (Ducati World Superbike) slotted in fifth, while Alex Lowes (Voltcom Crescent Suzuki) made more progress as he completed a final swap to the FTR rear swingarm that Laverty has used for some time. He found no chatter with it this time around and should continue to use it. Marco Melandri (Aprilia Racing) was depressed by his performances on the weekend but found something in his set-up to improve his mood and performance on used tyres, as did his team-mate Sylvain Guintoli. They finished seventh and eighth respectively. Leon Haslam tried to break into the 12’47s on his Pata Honda and eventually succeeded with ease. He saw out the top nine riders and ended up only 0.497 seconds from his team-mate and fastest tester Rea. The Evo bike competitors were headed by Niccolo Canepa (Ducati Althea) in tenth. He was still more than a second from the fastest Superbike rider. Leon Camier, in his first real test for the BMW Motorrad Italia team, was 11th, Ayrton Badovini (Alstare Bimota) was his shadow in 12th. The full Superbike MV Agusta RC Yakhnich Motorsport F4 of Claudio Corti took him to a lap time that was only 1.6 from Rea, and was good enough for 13th place. Regular Superstock 1000 rider Lorenzo Savadori rode a Superbike level Pedercini Kawasaki to 14th and the last rider inside the top 15 was Christian Iddon (Alstare Bimota BB3). There was no Kawasaki Racing Team presence at these tests, so no Tom Sykes, Loris Baz or David Salom.